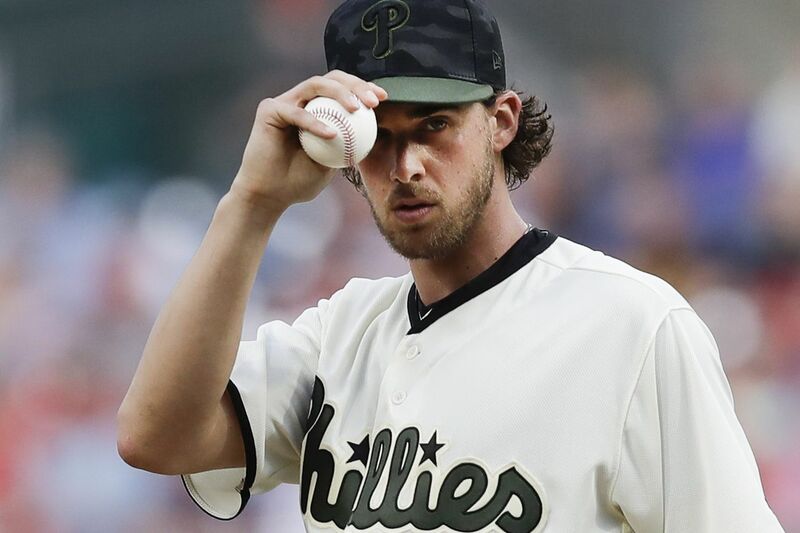 Phillies ace Aaron Nola, tied for the NL lead with 11 wins, was selected to his first All-Star Game. PITTSBURGH — Gabe Kapler called a team meeting on Sunday afternoon, just before the Phillies headed out for the series finale at PNC Park.. The Phillies manager had an announcement to make: Aaron Nola was an all-star. "It was as proud a moment for this clubhouse as you could possibly imagine when people heard that he was selected to be a major-league all-star. He earned it and every bit of praise is deserved," Kapler said. "I told them we wouldn't be where we are today without Noles' contributions, which have been off-the-charts good." Nola was selected to be the team's lone representative In the All-Star Game on July 17 in Washington at Nationals Park. He will start Monday in New York and then pitch again on either Saturday or Sunday in Miami. Nola will not be allowed to pitch in the All-Star Game if he starts on Sunday. The righthander joins Randy Wolf and Cole Hamels the only homegrown Phillies pitchers in the last 20 years to make the All-Star Game. "It feels good. My first one. I watched it on TV a lot, so it will be exciting to see what it's all about and see all the all-stars," Nola said. "I wasn't really trying to pitch to be an all-star, I was just trying to do my job for the team and try to win for the team and do my part." The Phillies were denied a second all-star despite being in first place and having 20 more wins through 87 games than they did last season. Rhys Hoskins, Odubel Herrera, and Seranthony Dominguez seemed to have a chance to join Nola. The Phillies have not had multiple all-stars since 2013. Nola entered Sunday ranked third among NL starters in WAR (3.6), fifth in ERA (2.41), fifth in strikeouts (116), and tied for first with 11 wins. Three years after his major-league debut, Nola has emerged as of baseball's elite pitchers. "I've had my ups and downs for sure," Nola said. "I had a decent time when I came up in '15 and then a bumpy road in '16 when I got hurt, and then last year I did well and had my back injury but finished out the season healthy. This year, I made it to the All-Star Game. Definitely had my ups and downs, but I feel like I've learned a lot about myself and who I am as a player." The Phillies' starting pitchers entered Sunday with the highest WAR in the National League (9.8), the fourth-best ERA (3.76), and the fifth-best strikeouts per nine innings (9.11). They are able to think about the postseason because of their starting rotation. And Nola has been the leader. "He's a calm, confident, competitive and very talented individual who really knows how to pitch," Kapler said. Cesar Hernandez was out of the lineup for a second straight day after fouling a ball off his foot on Friday night. He was used Saturday as a pinch-hitter and Kapler said the Phillies are just trying to rest him. … Zach Eflin will start the first game of Monday's doubleheader against the Mets at Citi Field with Nola starting the second. The Mets will start righthanders Zack Wheeler and Corey Oswalt. … The Phillies have not named a starter for Tuesday. That could be pitching prospect Enyel De Los Santos. … They will add two players from the minors before the game after Drew Anderson was optioned and league rules allow a 26th player for doubleheaders. … Vince Velasquez should be activated from the disabled list to start Wednesday.